Cable drive with center rail. Drive unit is installed at the inner side of the rear quarter compartment. 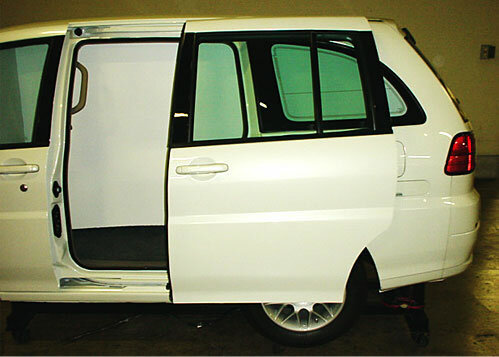 The door can be stopped at any position by operating a one-touch switch, such as the one for the driver's seat during the automatic operation control, making the door open and closed automatically. Assist electric start control in the operation direction during manual operation of the door. Manual open/close is possible when the Main switch is off. Operation speed reduction control approximately 300 mm before complete closure during electric close operation. Reverse operation control to fully open/closed when an object jam is detected. Reverse operation is also possible when there is a jam during reverse operation. Runaway speed control using an intermittent clutch to prevent door runaway when the door is stopped halfway.